For thousands of years, the 4 minute mile was considered not only physically IMPOSSIBLE, but according to doctors of the time – actually dangerous to the health of anyone who attempted it. So breaking that barrier proved too much for runners for centuries. But then on May 6th, 1954 a 25-year-old medical student named Roger Bannister – smashed through the 4 minute barrier in what Forbes magazine called the “Greatest athletic achievement of the last 150 years”. The case of language learning is a far more complex area in many ways, as too often the ones who succeed are subtly dismissed by the description, “Oh, s/he is clearly talented”. The subtext being that, “I am not, so I am excused”. That may be a bit harsh but I state it this way to get the point across. Let’s look at an example of a prodigious polyglot, Timothy Doner, a prodigious polyglot. What is really interesting in his case that for quite a long time he would not have been describe as “talented“. He was exposed to language classes but his results were nothing exceptional. In fact the experiences of most people in language classes is just like that. The results we can get may have NOTHING to do with our capacities. Our capacities only see the light of day when the conditions are right. One set of conditions which is clearly right is when we learned our first language, without doubt the hardest of all languages to learn.We all do it amazingly effortlessly and to the level of those who we associate with, by and large. Learning a language is a bit like learning to swim. We all could learn to do it as we have what it takes. However some don’t because they just don’t need to as there is no water around. Some are not interested in it, possibly because it has no attraction for them. Then there are others who have tried but have not devoted enough attention to it and get put off by the “difficulties” or the “discomfort”. These same ones at times end up developing the belief that they are not meant to swim, or that it is just too hard. Then there are others who, for some reason, have become scared of the water and hence refuse to even try. Our experiences for the most part shape our beliefs so when we struggle with learning, most people end up believing that the reason is their abilities not the methods used. Then these beliefs all too easily become self fulfilling. However one set of similar experiences can break a person, or make a person, Nelson Mandela, a case in point. So experiences are important but there are other factors that come from who we are, that can turn experiences into a justification for failure, or as something to learn from. New experiences can help transform our attitudes and beliefs. If you are open to reaching beyond what you know, it is critical to reassess your experiences and not reject new experiences that fly in the face of your beliefs. You can also work to come to a more accurate understanding of the cause of your struggles; ultimately though it will be your experiences and what you do with them that will help you to transform your results. Experiences are a food for our soul. One experience in our life or sometimes, hearing of another’s experience can completely transform our existence. Through it we can come to understand at an essential level that what we believed in the past is no longer accurate. In moment we can open up a whole new world view. I remember when I went to my first Silent Way language class, where I learned Chinese, my view of language learning and my own capacities changed and they never have returned to where they were before that time. From that experience I came to believe that I had enormous untapped abilities, that learning languages could be invigorating rather than debilitating, that a teacher could inspire, not just teach; that learning language was at its heart putting words to an awareness or experience, not just a form I had to learn, and so much more. It was my experiences that changed my ideas, my beliefs and my possibilities. From there I went on to explore many different ways of learning and teaching languages. None of which would have happened without that set of experiences. For each of us there are experiences like that in our lives which are pivot points, from which we alter the trajectory of our lives. Sometimes it is only in hindsight that we recognise these as seminal points, other times it is just obvious and we may just allow these experiences to work their magic. It is when that happens that our beliefs (formed in the past) can start to have less control over our lives, and then our lives can be more about learning from our awareness and our experiences (in the present) so we can fulfil on the potential we all have to learn languages to the levels we desire. So if we let the 4 minute mile phenomena in learning languages resonate within us, we can see that our limits many times are self imposed. Once we see they are then, a sub 4 minute mile in learning languages becomes possible for all. 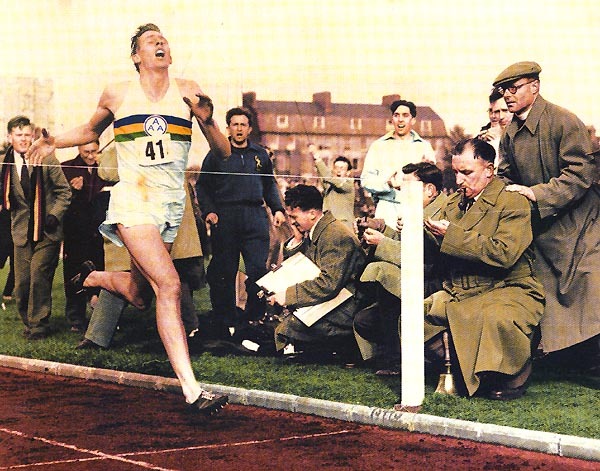 A great insight as to what drove Roger Bannister and what kept him at it – in his own words.